Good scientific models are formalized hypotheses that can make predictions about system behavior. How can scientists evaluate the strength of a candidate model, or which one is best among many such models of the same system? SciDash is a project that enables the reproducible execution and visualization of data-driven unit tests for assessing model quality. It is a 21st century vision of the scientific method. What if every competing model was transparently evaluated against a suite of unit data-driven tests? SciUnit, a Pythonic framework for data-driven unit testing that separates the interface from the implementation, respecting the diversity of conventions for modeling and data collection. NeuronUnit, an extensible SciUnit-driven library for the testing of neuron, neural circuit, and ion channel models using common simulators against multiple data sources. A SciDash portal to identify test repositories on GitHub, make it easy to locate them, execute suites of unit tests locally or in the cloud, and visualize results online with rich markup. 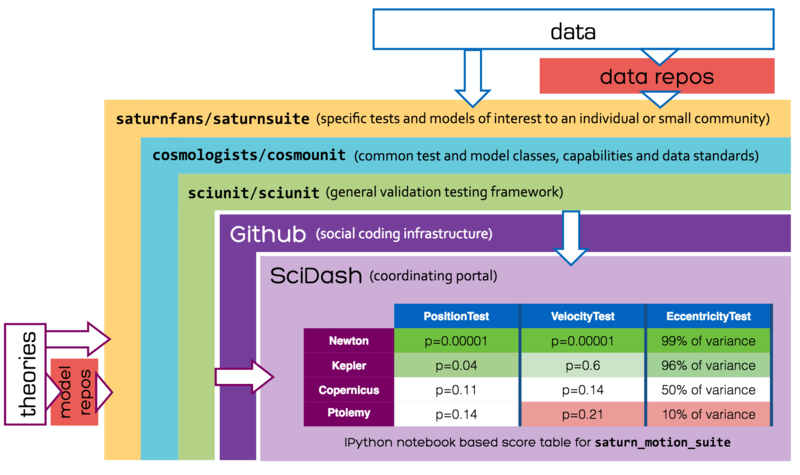 The SciDash project aims to make validation of scientific models against experimental data easy, transparent, and continuously integrated into the model development process. Let’s identify the best models together!